Having observed our 2/3-year old taking over the iPad as her computer, I’m becoming interested in UI for kids and toddlers. LukeW has some good points in this blogpost, but apart from that a quick search didn’t bring up much iPad specific UI thoughts for kids (except for this other one here). One thing I noticed is that Amelia tends to tap things very fast, sometimes too fast for the tap to register. She also quickly learnt (from watching me) to swipe the unlock thing when starting. She likes simple games, animals making sounds, eating the apple, … She also likes watching pictures and videos of herself, and she can very quickly navigate to the photo app to a specific photo or video. She can also easily navigate the main app "homescreen”, swiping left and right to find apps. 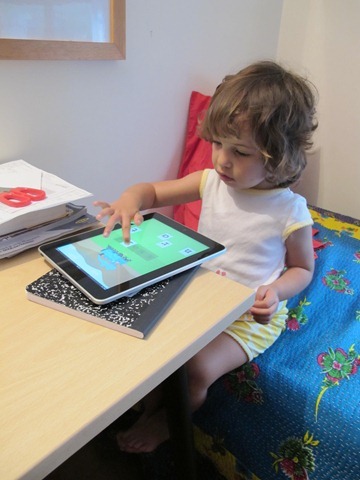 Would love to hear more thoughts on babies/toddlers using iPads. Previous postGoogle Chrome warns me that Google.com is unsafe? Soon after my boy, Jack, (now 2.5) learned how to swipe open the iPhone, he was trying to unlock and manipulate objects on every flat panel display he found. Naturally, he suspects that any display interface might be interactive. I still catch him trying to drag around the on-screen graphics on cable TV on our livingroom 42″ LCD. On the iPad, his favorite activities are driving in Real Racing, looking at photos of himself, a xylophone sim, and a koi pond sim.